Darrell and Sadie Brommer’s 6-year-old homebred mare Prado’s Sweet Ride led every step of the way and drew off in deep stretch for a decisive 4 ¾-length triumph over odds-on 3-5 favorite Devine Miss Grey in the 103rd running of the $200,000 Falls City Handicap (Grade II) for fillies and mares on Thanksgiving Day at Churchill Downs. Prado’s Sweet Ride, trained by Chris Block and ridden by Florent Geroux, ran 1 1/8 miles over a fast track in 1:50.50. Breaking from post No. 6 in the field of seven, Chicago-based Prado’s Sweet Ride broke on top and dictated the terms through fractions of :23.93, :48.60 and 1:13.17. Devine Miss Grey stalked the pace from the inside and came within 1 ½ lengths of the leader at the top of the stretch, but Prado’s Sweet Ride turned back the challenge and drew away late while being geared down in the final yards. “I really didn’t expect to be on the lead but I thought we would be close to the pace,” Geroux said. Prado’s Sweet Ride, who carried 118 pounds during the victory, is an Illinois-bred daughter of the Block-trained stallion Fort Prado out of the General Meeting mare Excellent Idea. The victory was worth $121,520 to her owners and brought Prado’s Sweet Ride’s career earnings to $548,914 from a record of 8-5-7 in 30 starts. This was the second graded stakes win of her career and both have come at Churchill Downs. In 2015, she scored a 9-1 upset in the $100,000 Regret (GIII) with a head victory over Lady Zuzu. For Block, this was his second Falls City Handicap victory. He won the 2010 Thanksgiving Day renewal with 3-year-old filly Dundalk Dust. Prado’s Sweet Ride returned $13.80, $4.80 and $3.60 as the 5-1 second betting choice. Devine Miss Grey, who carried the 122-pound starting high weight under Tyler Gaffalione, finished second and returned $2.40 and $2.10. Dutch Parrot was another length back in third and paid $4 to show under Ricardo Santana Jr. while carrying 116 pounds. Red Dane (ITY), Dreamcall, Skeptic and Mannerly completed the order of finish. Honor Ride was scratched. The Falls City is the traditional main dish on the Thanksgiving Day menu at Churchill Downs – a Louisville tradition since 1969 where more than 8,000 turkey dinners are served with all the trimmings, making it the largest number anywhere in the region. This year’s holiday program also included the 45th running of the $100,000 Cardinal Handicap (GIII), a 1 1/8-mile test for fillies and mares over the Matt Winn Turf Course, which was won by English Affair. Racing at Churchill Downs resumes on “Black Friday” with a 12-race program that begins at 1 p.m. (all times Eastern). 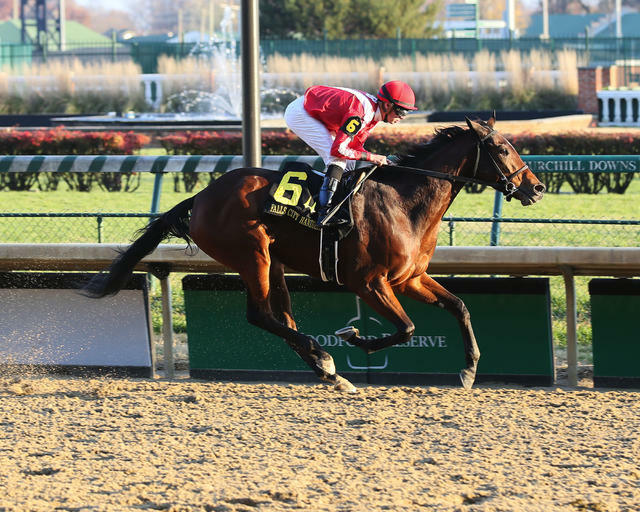 The 144th running of the $500,000 Clark Handicap Presented by Norton Healthcare (GI) highlights a program that also includes the 28th running of the $200,000 Mrs. Revere (GII) for 3-year-old fillies at 1 1/16 miles on the Matt Winn Turf Course. Also, there’s a $196,438 carryover in the 20-cent Single 6 Jackpot, which covers Races 7-12 starting at 3:57 p.m. and a $6,415 carryover in the finale’s $1 Super Hi-5.